Two years ago this month, Wendy's finally began offering a variation on their 36 year old "Frosty." The original Frosty was chocolate... in July of 2006 Wendy's started selling a vanilla Frosty. Now Wendy's has a whole new collection of Frosty variations. These new variations include sippable ones. The original Frosty was served only with a spoon. Twisted Frosty in Oreo, M&M, and Nestle Toll House Cookie Dough. 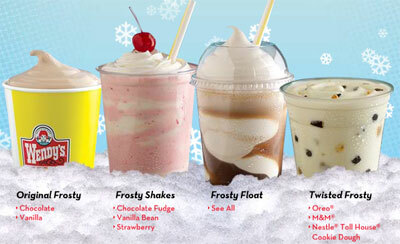 I recommend the Frosty Shakes, especially the strawberry. They're really good and are smoother than the regular Frosty.